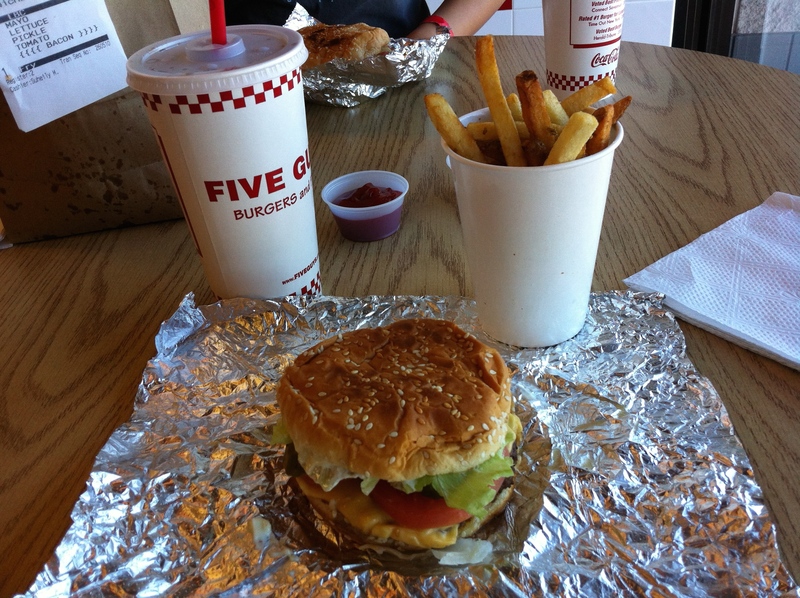 …, along with my aching quads that kept me from getting out of a chair in a normal manner. I honestly thought the Houston Marathon would be my PR race for the year, so even though there are other events on the horizon, I feel like I’m working on next year. But that’s ok too. Fortunately, after two days of active recovery on the stationary bike followed by a rest day, I was ready for a short run on the treadmill by Thursday. My energy level was good and my motivation was back. I didn’t push the pace, but ran an easy pace for three miles after a warmup walk. Recovery was priority as I focused on nutrition. Again. I’m happy to report that I made it through the entire week on track. 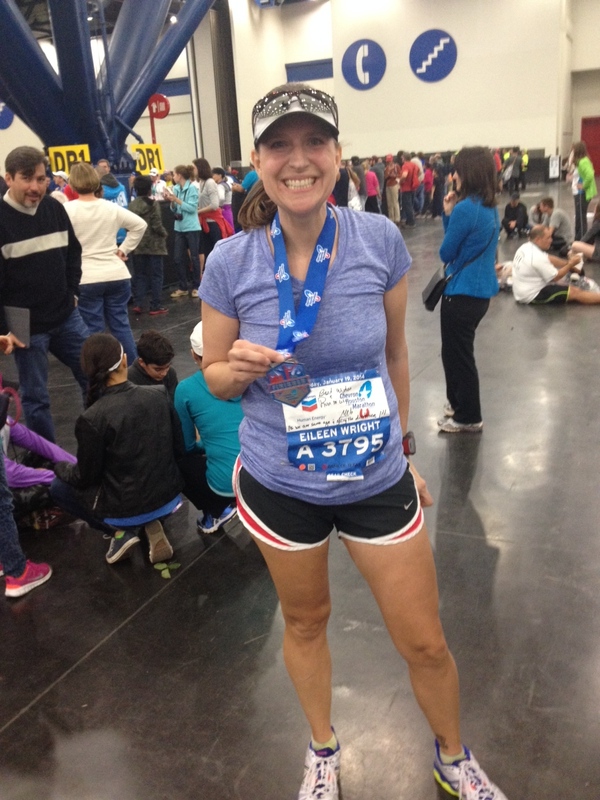 I could stand to lose the few extra pounds I was carrying for 26.2 miles. I also spent some time formulating my goals for the coming year, trying to decide how to handle training for the next few weeks specifically. You see, I have another marathon coming up on March 1st. 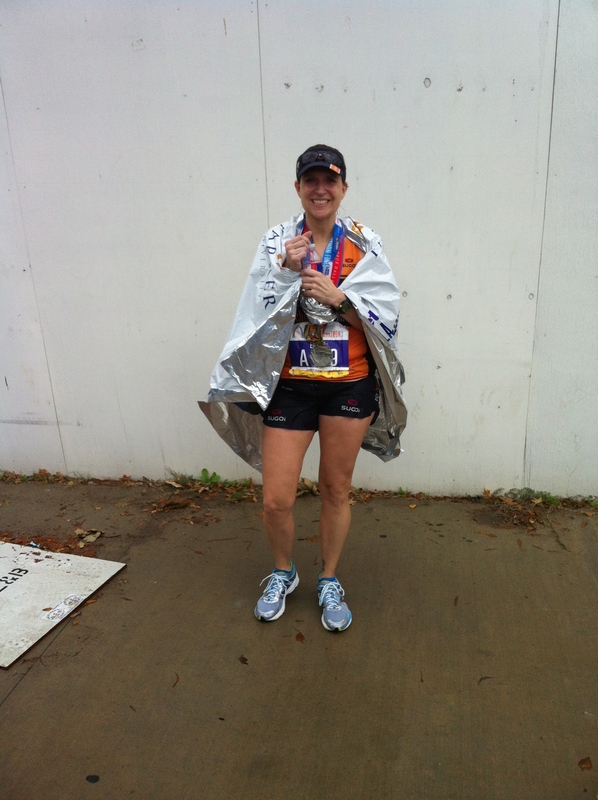 To some, it may not look like I have the best approach to marathons, but I have found what works for me so far. I don’t run well in warm weather. I don’t run well in humid weather. I live in Texas. The weather changes all the time. In winter, we wear tank tops one day and long sleeves with tights the next. 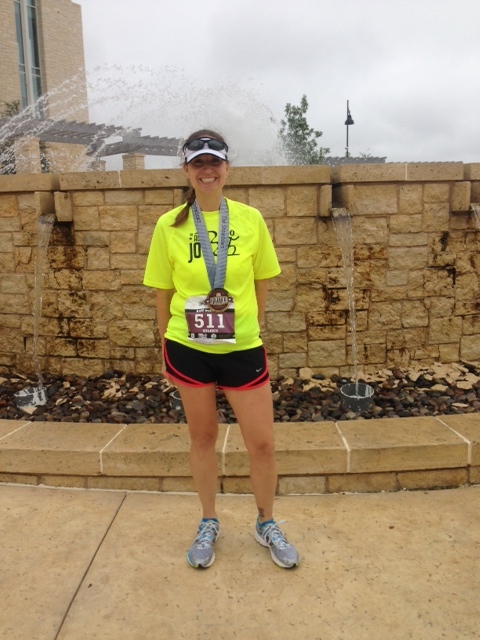 The chances of me running a marathon (in Texas) in humid or warm weather is pretty high. Last week in Houston was the best race day weather I’ve had. I say all this to justify my marathon season. I like to have contingent races in case of bad weather, an off day, and just because I like to support the races that are close. I did decide against going to Oklahoma City this year though. The past three years the weather has not been kind to me. 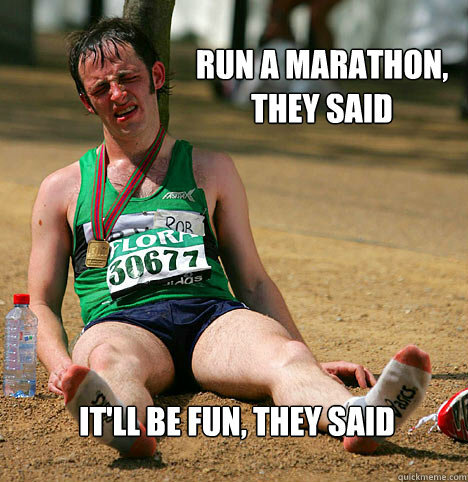 I’m going to take a break from marathons after March 1st, until it’s time to start training again in the fall. 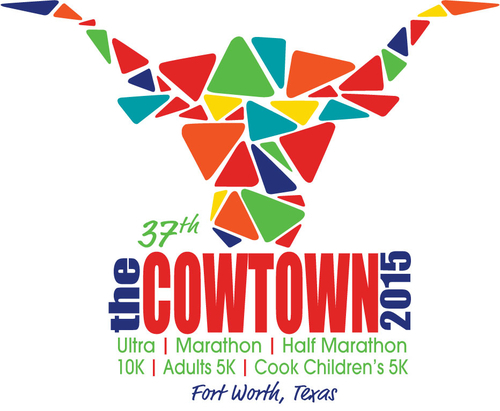 Maybe Cowtown won’t be a PR race. It may even be slower than the last two, but I’m going to go have fun with it anyway. 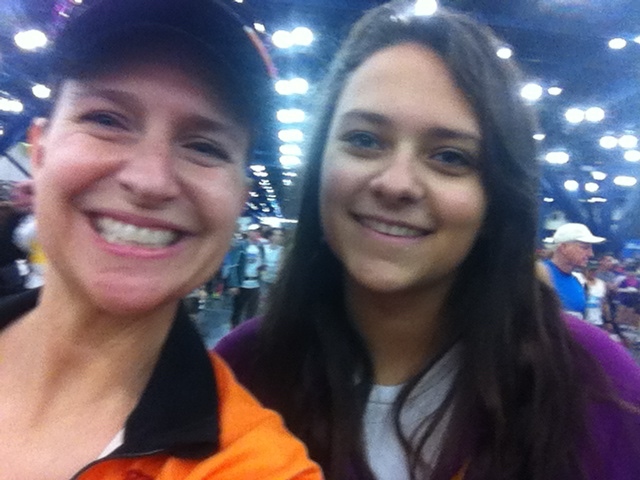 My running friend is doing the half so we’re going to run together until the split. Also, my dad’s running his first half marathon then. At age 65! I’m a little excited. So while I continue to work on my plan to reach big goals for next year, I’m going to take the pressure off of myself and relax a bit. This Sunday I’m running a half marathon in Dallas. I don’t know if I’ll try to race or just take it easy. Only time will tell. 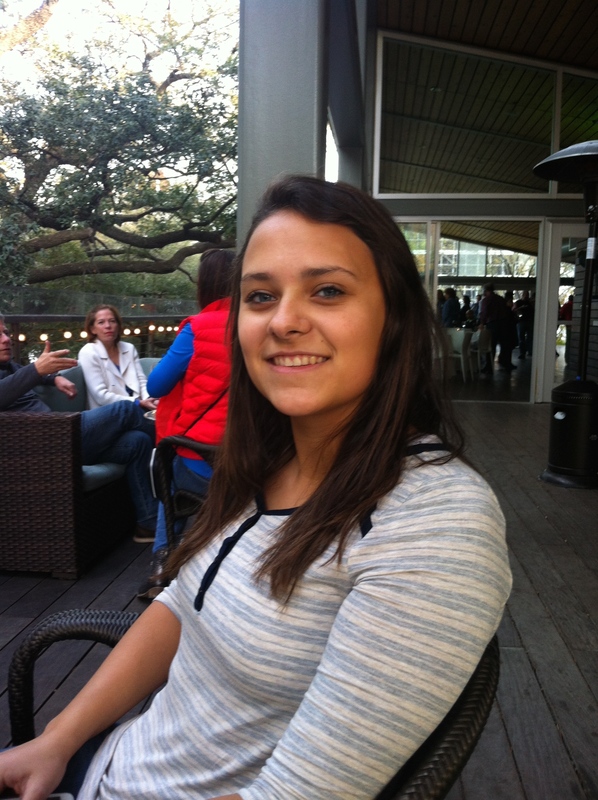 When I first decided on my goals for Houston, I made sure some of them were easily reachable. Only one goal was attached to time. Spoiler alert: that was a good thing. I started my weekend early Friday afternoon when I loaded the kids in the car and headed south. A part of me was disappointed because my husband had a work conflict and couldn’t go. 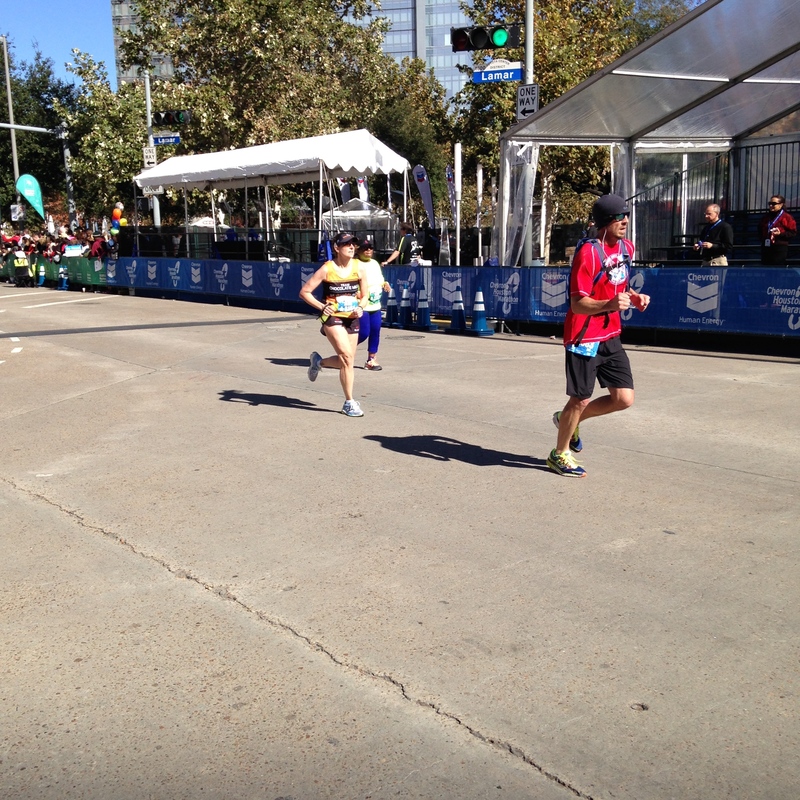 He’s been at every marathon up to this point including the good (Houston 2014), the bad (OKC weather), and the ugly (Dallas 2012). But since he was away, that meant my oldest daughter got to slide in place as my race crew and she served her position well. We checked in to the hotel Friday evening and walked around a bit downtown. 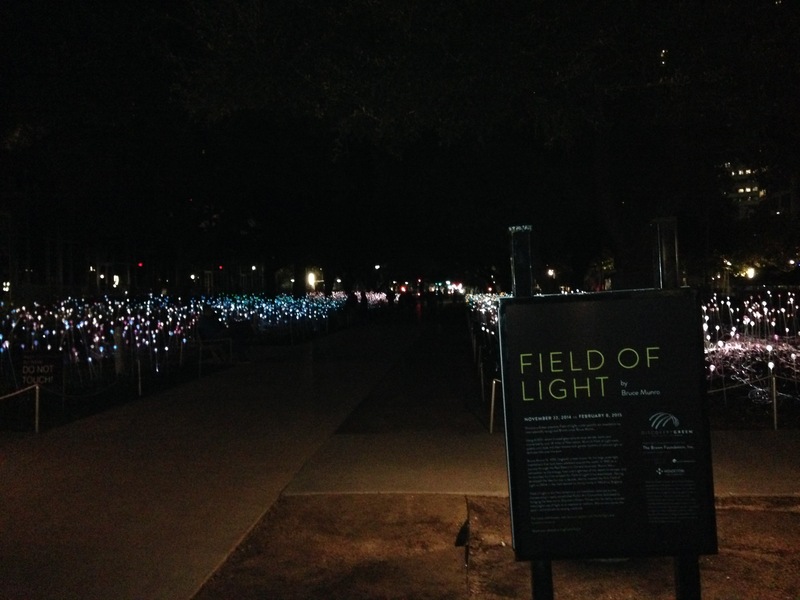 We explored Discovery Green which had an awesome light display (the picture doesn’t do it justice). 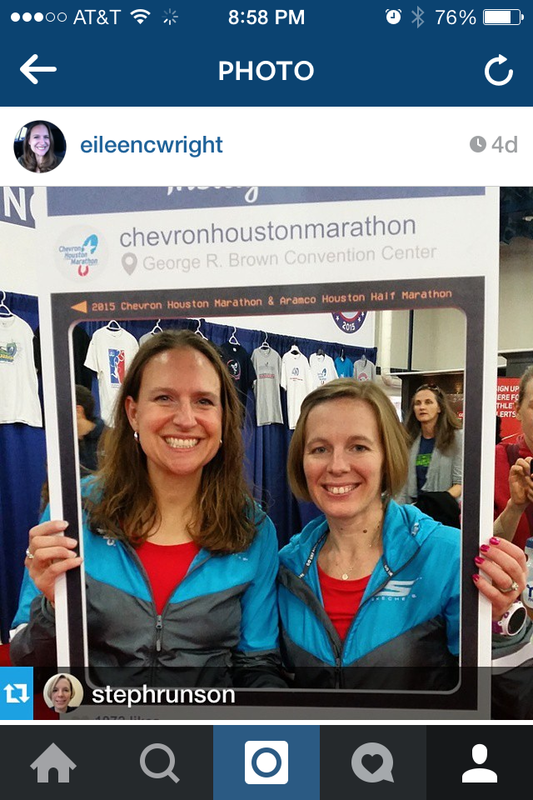 Saturday morning I headed over to the expo, met some of the other race ambassadors, and picked up some gear. 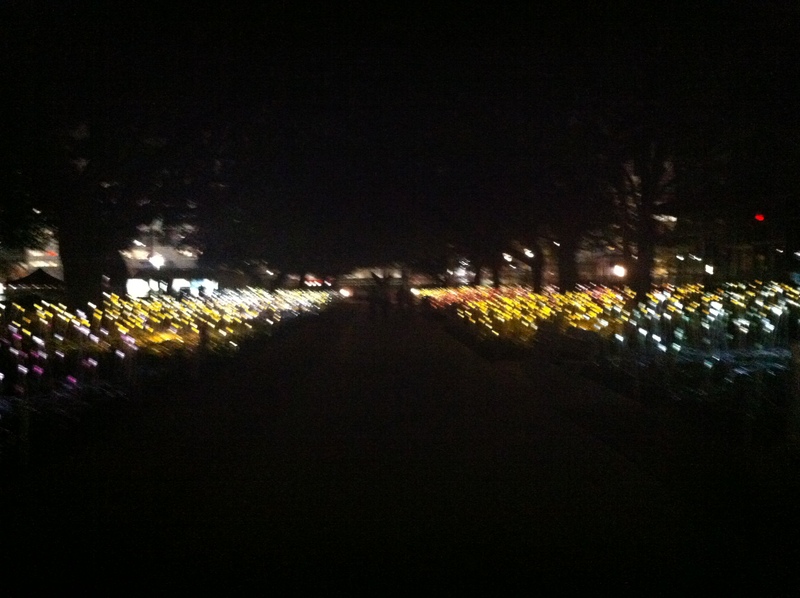 I spent some time walking back and forth taking pictures for people with our Instagram frame. Then I did a little shopping to stock up on Nuun, get some new sunglasses, and found a new pair of shorts for $10! 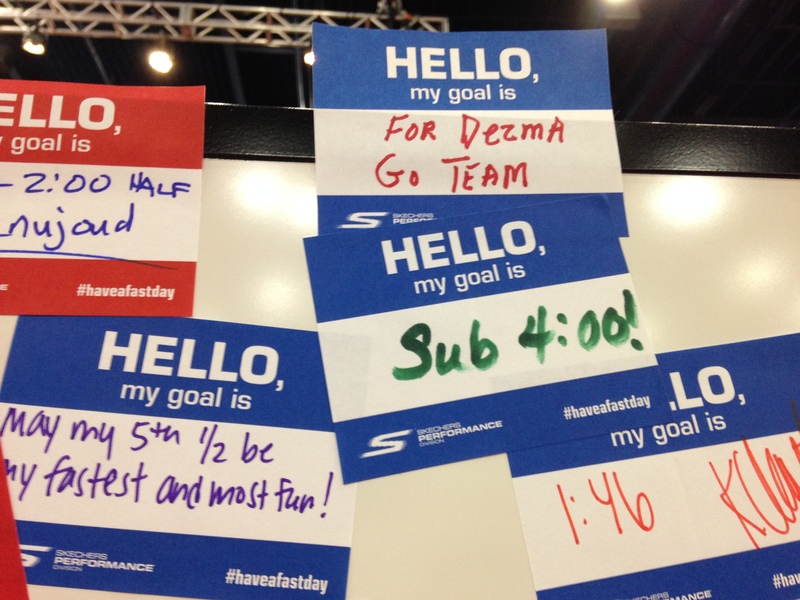 I wrote my goal on the wall, and why I run Houston (it’s flat!). After spending four and a half hours on my feet, my daughter and I went to eat and rest in the hotel before the pre-race party. 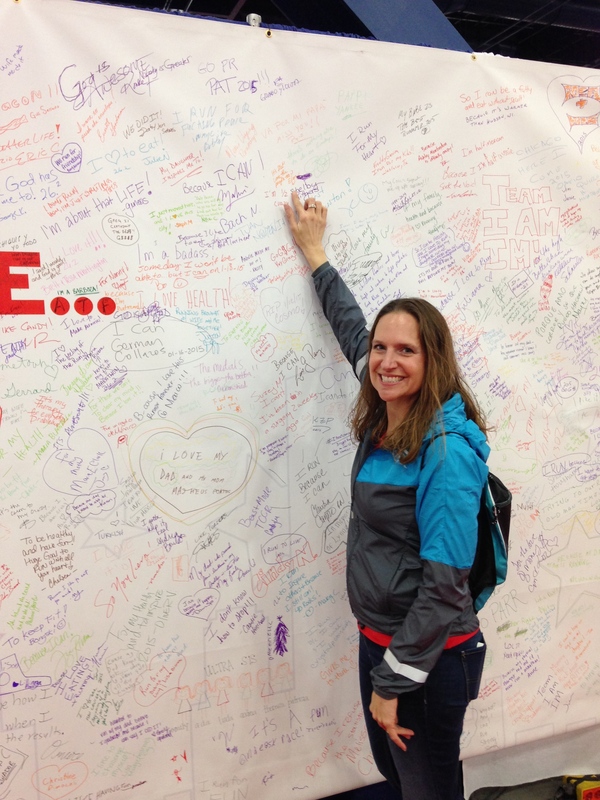 Nerves would creep in every so often as I thought about the race, but I pushed them aside. Whatever will be. Then we went to the pre-race party. 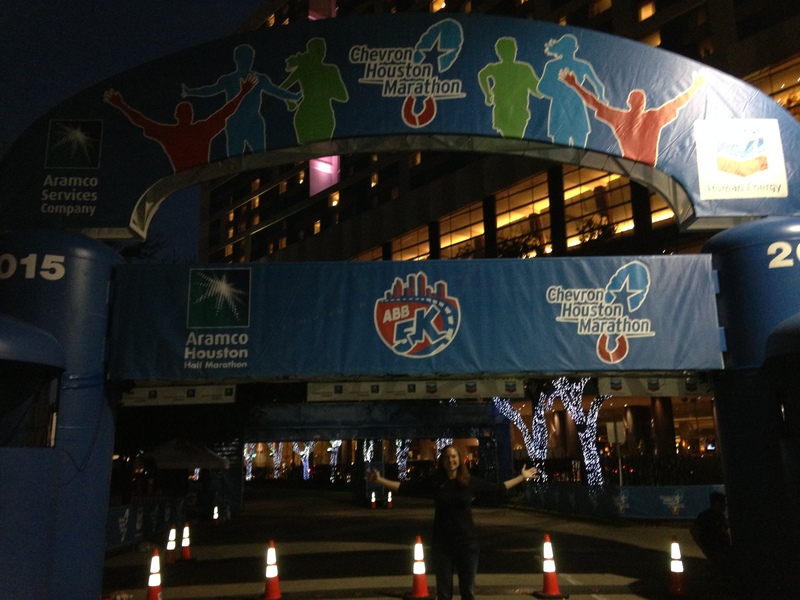 Thank you Skechers Performance and Houston Marathon Committee! 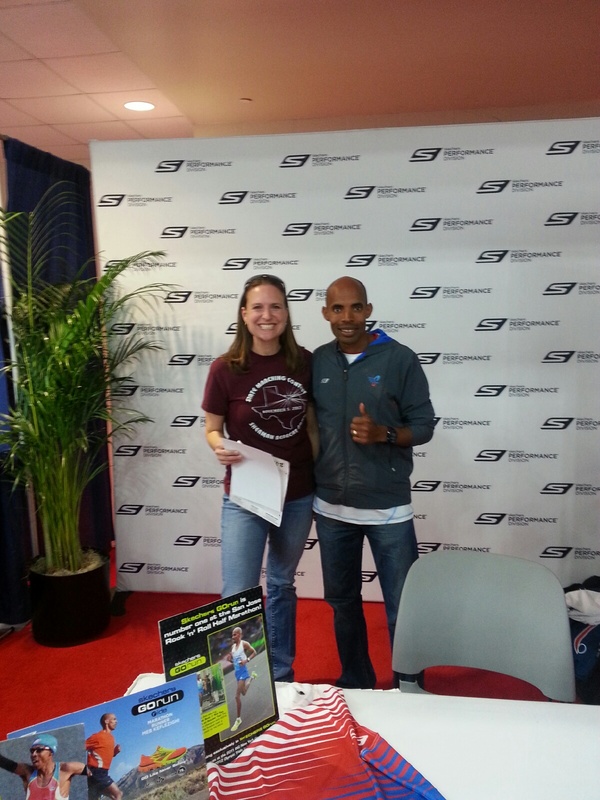 Yes, Meb was there but I didn’t approach him since I did meet him last year at the expo and he signed my bib. 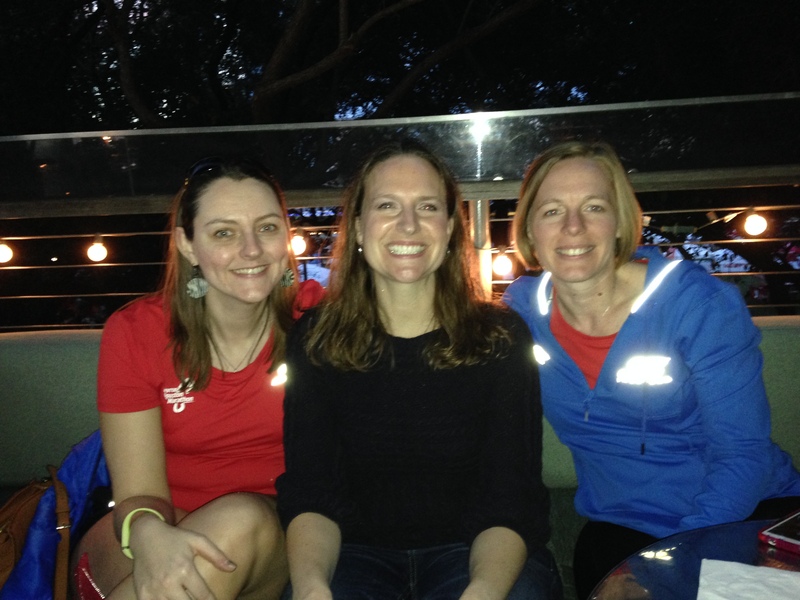 We hung out with fellow ambassadors Lisa and Steph. Then we all took pictures at the finish line. 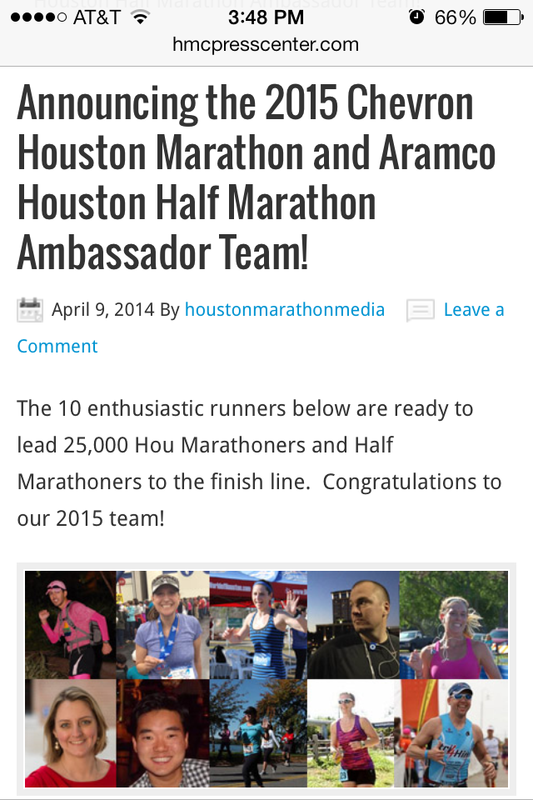 Having the opportunity to serve as a race ambassador for the Houston Marathon still blows my mind. Here I am, this mom of four who lost her identity in her children, and who stumbled upon a new passion just trying to complete a big “someday goal.” Then I was given the chance to represent this amazing race that I fell in love with last January. The only thing that could make the weekend better would be a great race performance. The next morning I was ready. Let’s do this. 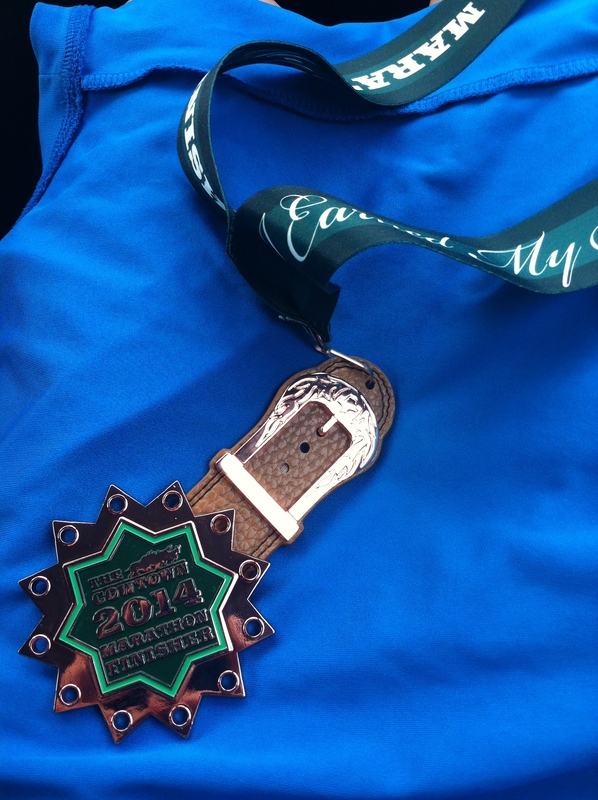 The weather was perfect for running a marathon. I decided to go with 9:15 for the first five miles and then bump up the average for the next five. I felt like I was holding back and the first mile was 9:12. By the end of mile 5, I was running 9:07 average. But I still felt like I was holding back. I did notice that I was sweating quite a bit on my forehead though. The next five miles I ran an average of 9:05. I felt like it was cooling off. Then my pace started to slip. The first hill at mile 12 almost did me in. What? I train on hills all the time! Why was I struggling? At the half point I was just over 2 hours and I knew that I wouldn’t PR. 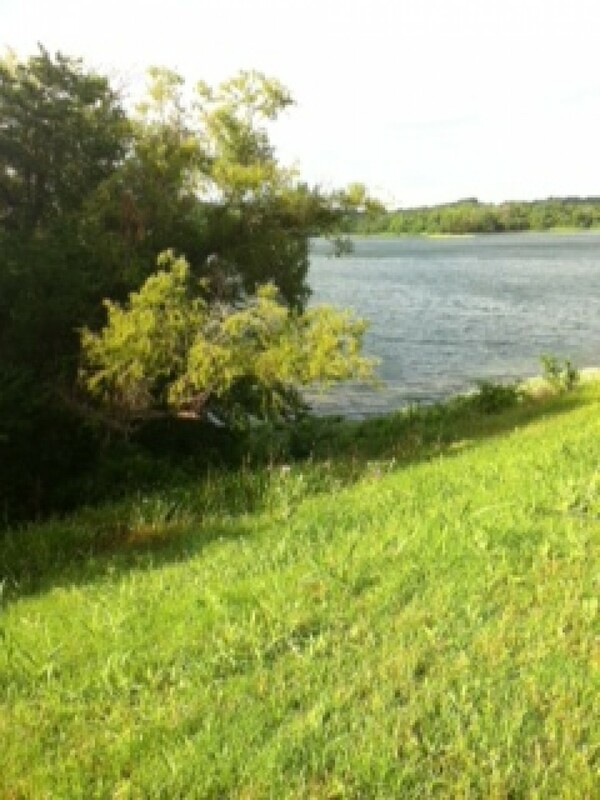 I took my first walk break to catch my breath and ease the nausea. I felt heavy in the middle. Darn Christmas cookies! I then settled into the same pattern I did in Dallas. Walk fast for a minute or so, then pick up the pace and run for several minutes. 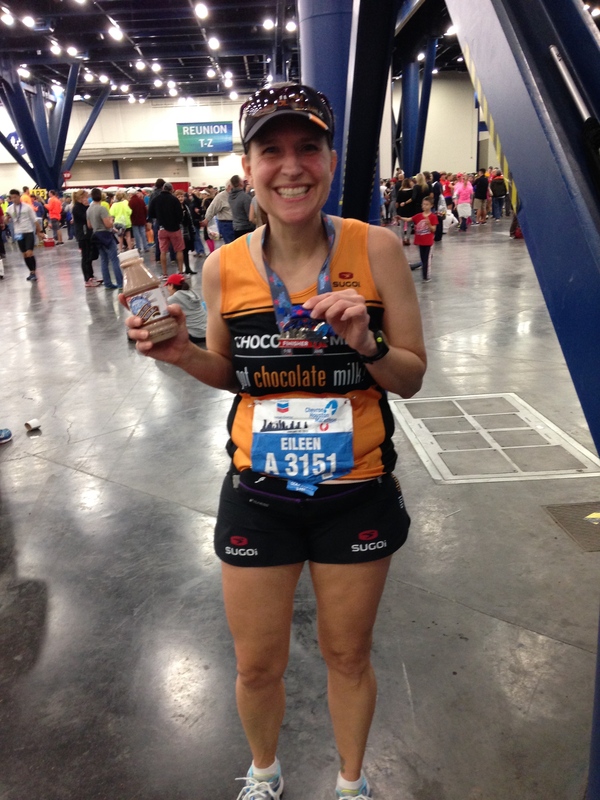 I had decided after Dallas 2012, when I nearly dehydrated, that I would rather slow down and finish feeling good, than throw up or not finish. So that’s what I did. I put more effort into thanking the volunteers and spectators. When people commented about their love for chocolate milk, I agreed. 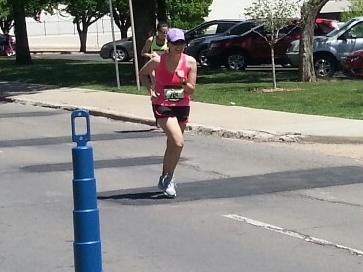 I tried to make eye contact with everyone who cheered for me by name. I smiled. 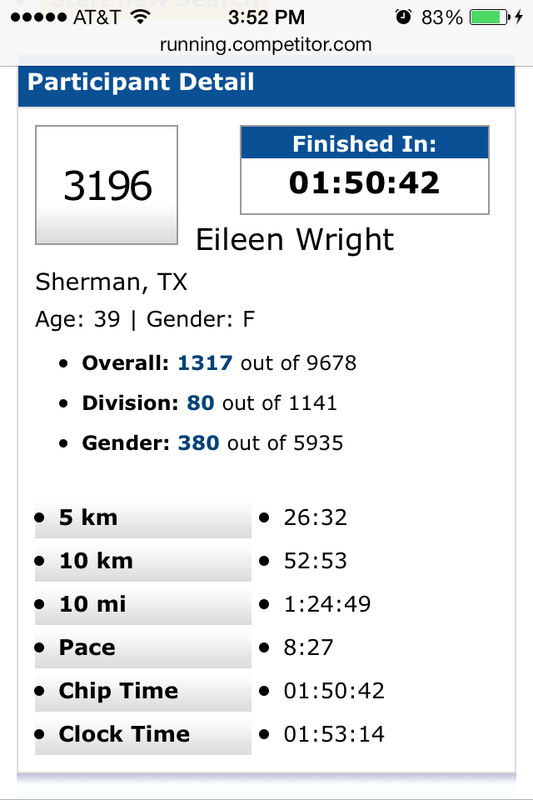 My splits were terrible (by my standards), but it was okay. 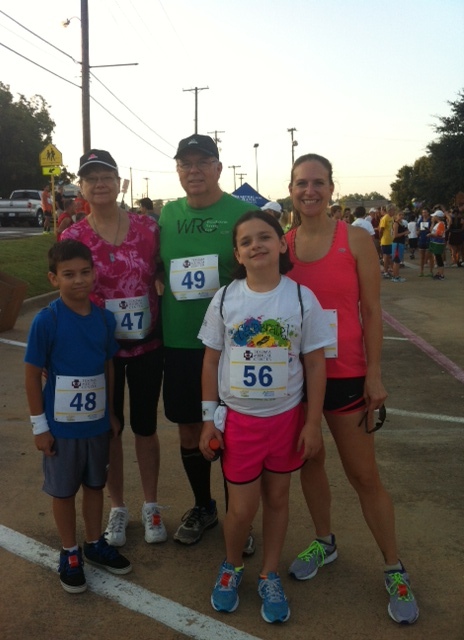 I missed my goal, but I was still 3 minutes faster than I was in Dallas – five weeks ago. I have never been so happy for ice cold chocolate milk. Just a side note about how awesome my daughter was over the weekend. She went with me to the start corral, took my gear back, made it to the finish bleachers to watch most of the race – starting right after the half marathon winners came through, then met me in the family reunion area by the time I got my food. She was amazingly supportive and helpful. She even drove part of the way home. The best thing she said to me after the race: Runners are so nice! Way to go Houston! I can’t wait to be back next year! I’m so excited! 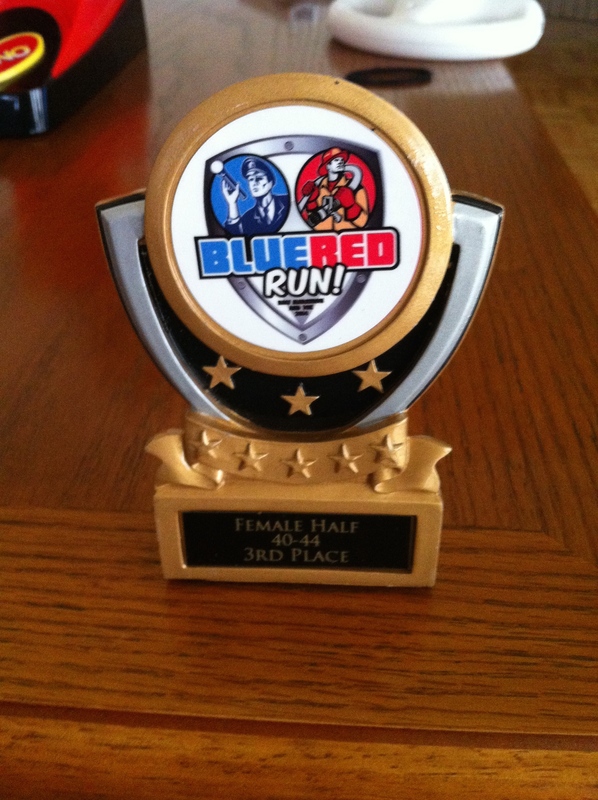 I have been looking forward to this race ever since I ran it last year! 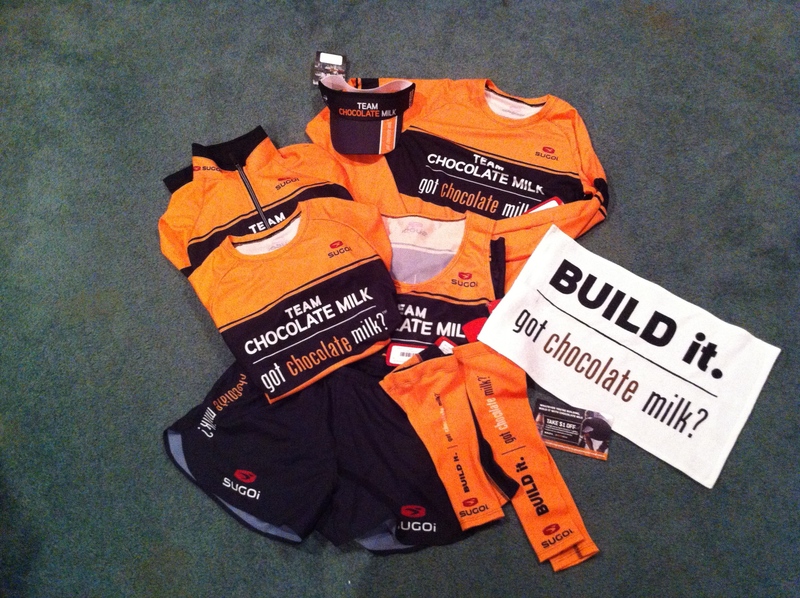 Having the opportunity to participate as a race ambassador has made it even sweeter. There are so many things I’m looking forward to this weekend – going to the expo, meeting the other ambassadors, and getting the chance to meet some of you who have followed along on this journey. 3. Smile and have fun. I tend to forget sometimes that running a marathon is a choice I have made. I get to do this. I should enjoy the process of running the race as much as the preparation that went into it. I’m out there because I want to be. My face should reflect it. 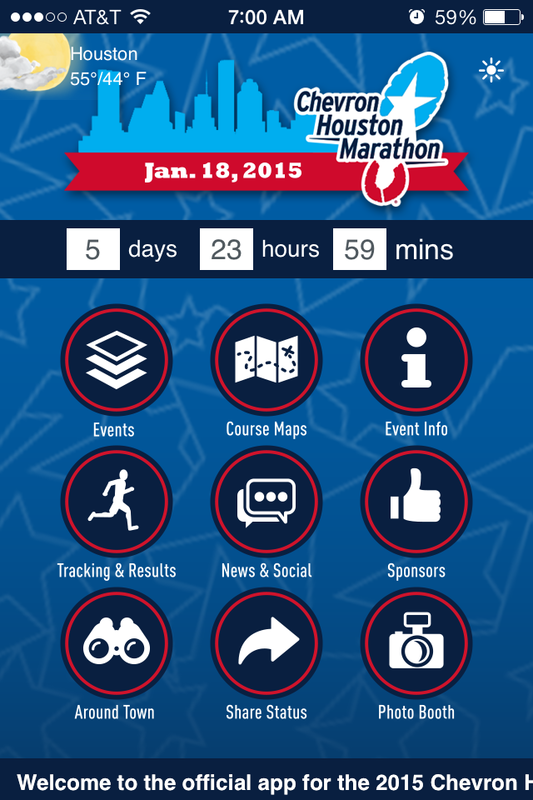 Don’t forget to download the Houston Marathon app to track your favorite runners. I’ll be at the expo on Saturday. You can follow my twitter or Instagram account for the time. I’d love to meet you!